Well that one goes without saying. To get a (positive) review of a kit you designed and made in the magazine that, back in 1984, got you into the hobby in the first place is I think something to be be proud of. Ego trip be damned. This was the logical conclusion of quite frenetic (for me) activity to get the damn thing finished and sellable after realising in late August that it needed to be done by late October or another year would pass. I got there, just, and so far the reaction has been very pleasing. Thank you to everyone who has supported my endeavours either in buying the kit or ordering plates. For 2013 my aim is to write some software which will generate most plate artwork for me, with the effect of both making the service quicker and giving me back more time to work on other things. Because there’s a growing list, with some interesting ideas on it. Personal modelling didn’t really get a look in in 2012, after all that. To be honest I didn’t especially have the inclination either. This year feels different already, though. I have an urge to get back into doing 009 again led in part by wanting some of the Peco RTR and also the realisation that I can’t actually run my own product anywhere. Plus there is a very interesting format for the Dave Brewer Challenge at ExpoNG. I’m not sure what this means for Cranbrook, though. 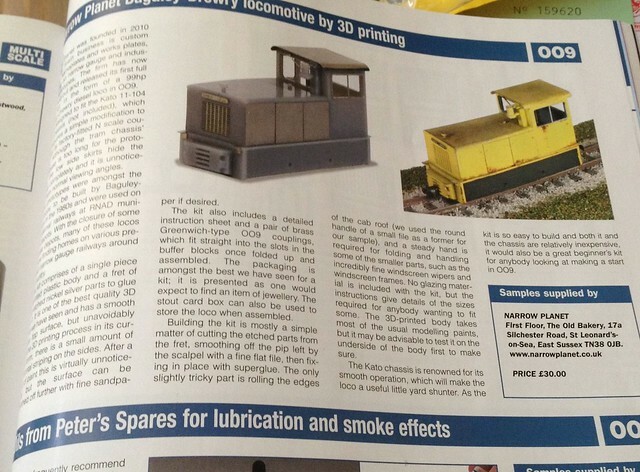 This entry was posted in 009, baguley-drewry, ego trips, meta, model railways, narrow gauge. Bookmark the permalink. Congrats! It was an excellent review for what looks an excellent product. I see the box making and assembly paid off with the comment about it being more like an item of jewelry.